Hydrobuilder.com has the largest selection of commercial grow lights available at the best prices. Whether you're looking for Commercial LED Grow Lights, Commercial CMH /LEC Grow Lights or the trusted Commercial Double Ended Grow Lights - we have them in stock and ready to ship from the largest network of distribution centers dedicated to cultivators in the USA. 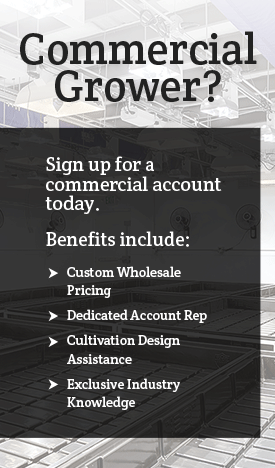 Sign up for our Commercial Grower Program to receive wholesale pricing, automatic reordering, a dedicated account rep & so much more. Special Price $1,179.00 on sale until 5/31/2019! It’s time to get serious about growing the best plants possible. Here you’ll find the best of the best when it comes to grow lights for commercial operations. Double ended HIDs and CMHs rule the commercial gardening world and are still unmatched by LED grow lights when it comes to large scale-operations. As such, at Hydrobuilder we focused this category on providing you with the best DE and CMH bulbs, fixtures, and everything else need to get them up an running and growing plants that rival all other operations big or small. Because these are commercial grow lights, the majority of the lights in this category are operated on 277 volts or 480 volts, and fall under either 315 or 1000 watts. A 315 watt DE or CMH bulb will rock a 3 x 3 with ease, while 1000 watts are perfect for filling out a 5 x 5. I’m not a commercial grower – will these lights be too much? This will depend on the size of your garden, voltage of the lighting fixture, and the light demands from your crops. Many serious home gardeners have grow spaces that are around 4 x 4. This allows them to grow multiple large plants at a time, while also ensuring that each plant has enough space to grow unhindered. For a space this large, you’ll need a lot of light – it’s recommended to shoot for a 1000 watts from an HID just to fill out your lighting footprint. The lights you find in this section are suited for commercial operations, so before buying a lighting system make sure the system can be run on a common house outlet. Home gardeners will need to stick to 120-240V for their gardens. 277 Volt is the input power that most commercial operations prefer for operating lights . 480 Volt volts is often seen as well, and is meant to run powerful and large industrial equipment efficiently. These two voltage go beautifully together because with a 480/277 volt 3 phase 4 wire system, you will not need a transformer to use the 277 voltage. This cuts down on energy use. The transformers needed to run 277/480V are currently incredibly huge and expensive, and can run an entire large-scale building – this is why you won’t see this high voltage in your house. For larger operations it’s much more economical to use higher voltage because voltage drops are less. Higher voltage = less current = less power loss from resistance. With a higher voltage you are able to put more lighting fixtures on a circuit as well.